Origami is an excellent activity to try with kids. They'll learn the fun of folding to create something new, while developing fine motor skills and hand-eye co-ordination. What else can origami teach us? First of all, patience! By learning origami, we also acquire maths skills, practise following directions, and develop perseverance. Origami holds a special place in my heart because I can take something as two dimensional and bland as a piece of paper, and transform it into something wonderful. It's a lovely, achievable craft that I've used with Grade 2+ students. Another reason I love using origami in an educational setting is because it's something That Kid can excel in. You know the one, the kid who thinks he isn't good at anything. Origami, with its practical construction techniques, might be just the thing for a young kinaesthetic learner. Or the child who loves Maths might come to life when she realises the close link between origami and mathematics. Young artists may want to explore monumental origami, or try something smaller like Robert Lang's arthropods. Robert Lang also has a fascinating TED talk that explains the evolution of origami and the math and magic within it. Teaching others how to create origami makes a wonderful project. Kids could do a "show and tell" for friends or classmates. A comic-type template of several frames makes an achievable way to for kids to demonstrate folds. They could even make a video and go global! This fits perfectly when kids are learning to write informative texts, particularly explanations and procedures. A lovely book to share with kids when you start origami is Saduko and the Thousand Paper Cranes by Eleanor Coerr and Ronald Himler. If kids are really interested in origami, it's a great idea to use this as a jumping off point to find out about Japan and other Asian cultures. Ask your local librarian for help in locating texts that will best suit your child. Do you have an iPad or iPhone? There's a free app, How to Make Origami, that's ideal for kids. Instructions are simple and easy to follow. iTunes. I recently learnt about Paper Titans, ($2.99) which seems to be a paper-folding adventure, and it looks intriguing. I found an Android app, Origami Instructions HD, for those of you who don't share my fascination with all things Apple. There are also websites that give instructions for creating origami. Origami Resource Center offers 10 step and under folds for beginners. Origami Fun has a range of directions, some in video form and includes downloadable pdf instructions too. Origami Club has themes to browse and I love their printable patterned paper, particularly the Japanese ones. What I like about Origami Player is that it shows kids what to do via animations and even pauses while they do it, with the length of the pause adjustable. 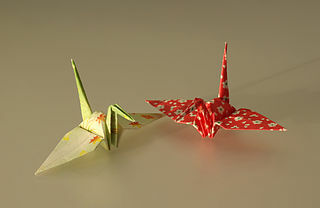 Image Credits: Above : Laitche - Cranes Made by Origami Paper, [Public domain], via Wikimedia Commons. 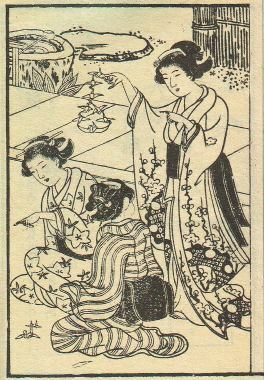 Lower: By unknown monk from Japan [Public domain], via Wikimedia Commons.